‘Where the Animals Go’: Who knew tracking wildlife would come so far? It’s a lot of information packed in a short space, well laid out, easy to understand and a pleasure to return to many times. As you make your way through this fascinating book, you might find yourself saying, “Wow. Who knew?” Who knew, for example, that jellyfish don’t drift aimlessly about waiting to bump into something to eat? Time-depth recorders tethered to their waists (jellyfish have waists?) show they swim up and down at speeds up to a meter per minute, actively hunting. Until scientists began tracking mountain lions with radio collars, who knew those in Southern California were “effectively marooned” by freeways? And although albatrosses are famous for long-distance travel, who knew until they were tracked with “light loggers” (light-sensing geolocators) that, during their circumpolar flights, up to 100,000 are killed annually when they tangle with longline fishing baits? 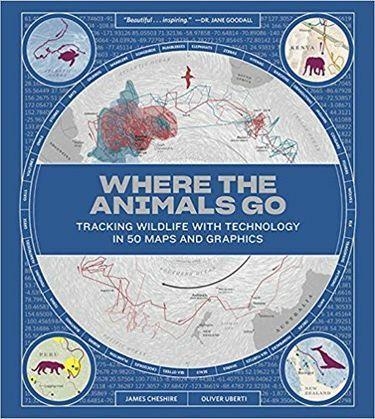 The co-author of “Where the Animals Go — Tracking Wildlife with Technology in 50 Maps and Graphics” will be joined by Melinda Holland of Wildlife Computers for an appearance at 7:30 p.m. Friday, Nov. 10, at Greenwood Senior Center, 525 N.W. 85th St., Seattle; $5 (townhallseattle.org). Instead of shooting specimens or following pawprints on foot, we can put GPS backpacks on geese, implant radio transmitters in otters and coat tiny plankton with fluorescing nanoparticles like those surgeons use to target cancer cells; we can observe animals’ movements from ever more sophisticated drones, satellite images, global wind data, camera traps and triaxial magnetometers. Some devices now take readings many times per second. And, like Cheshire who works in Europe yet easily teams with Uberti in North America, studies all over the globe are linking up online and publishing new information. In the past, for instance, whales were studied by harpooning them with “giant, barbed drawing pins,” meaning specimens had to be killed or collected once they died, providing few data points. But when Cheshire joined an orca research team near Iceland, he’d learned about it on Facebook. The marine research institute shares “their fieldwork and photos with thousands,” he writes, detailing how hydrophones and diving seabirds helped them locate a pod at sea. In fact, tourists’ Facebook photos showed those scientists some of the same whales had gone to Orkney and Shetland in Scotland. Irene Wanner lives in northern New Mexico’s Jemez Mountains.